Many of your students may have a very foggy idea about the historical and cultural developments in the West prior to year 1000. Oftentimes, influenced by popular culture, they simply think of this period as mysterious “dark ages.” You may take a quick poll to check how many of them agree with this label and then discuss what ideas they associate with it. Use this as an opportunity to correct this unjust, but widely held view. The period after the dissolution of Roman Empire and up to the year 1000 was an incredibly formative period of western medieval art culture, a time of great innovations and production of unique artifacts. These major societal, cultural, and artistic changes resulted from the fusion of three important traditions: Graeco-Roman heritage, the traditions of various people living or newly settled in Northern Europe, and a relatively new Christian faith. Although some were initially viewed as barbarians (foreigners) by the Romans, the northern settlers quickly adapted to Roman community life with many of them rising to prominent positions. Other settlers from Central Asia chose to establish their own communities in Europe to challenge the previous structures. This constant movement and migration happened primarily during the fourth and fifth centuries. In the following centuries, these various groups merged providing foundations for today’s European nations. Originally pagan, the settlers gradually converted to Christianity and adopted many of the Roman customs and laws, which helped to unify these heterogeneous populations. A few themes to stress throughout the lecture include art as a form of status symbol, the fusion of Mediterranean Christian and native pagan traditions, and the selective survival of artifacts. This will help students to understand that early Medieval art was not purely aesthetic, but also a symbol that could proclaim one’s status, education, identity, and culture. Also, by stressing that the archaeological evidence surviving from this period is very patchy, consisting mainly of small portable and non-perishable objects recovered from burial sites, students will be less likely to judge this period as “dark ages” devoid of artistic and cultural production and innovation. In addition, later buildings replaced most architecture, such as churches and palaces, and many other artifacts produced from wood, leather, and other natural materials did not survive in the northern climate. Muirdach Cross, sandstone, c. 923, h. 18′; Monasterboice, County Louth, Ireland. A great place to start is the Oxford History of Art Series books. Lawrence Nees’s Early Medieval Art (Oxford University Press, 2002) provides a wonderful overview of the non-architectural arts of the period all organized into concise thematic units. Roger Stalley’s Early Medieval Architecture (Oxford University Press, 1999) is a survey of extant architecture from the Carolingian to Romanesque period, although he mostly focuses on British and north-western European examples. Henry Luttikhuitzen and Dorothy Verkerk’s Snyder’s Medieval Art (Pearson, 2005) provides a comprehensive survey, although it is less focused on the contextual and cultural analysis of the artifacts. To learn about manuscripts, I strongly recommend Raymond Clemens and Timothy Graham’s Introduction to Manuscript Studies (Cornell University Press, 2007). Smarthistory also has useful teaching materials in this area including a video on manuscript production and illumination that you may show in class. A beginner’s guide to medieval Europe and Latin Europe may be especially useful way for the students to sort the material when preparing for the exam. The golden buckle is a cultural object representative of the Anglo-Saxons, a society that controlled the terrains of what was previously Roman Britain. Many artifacts have been found in Anglo-Saxon England, particularly in region of Kent, most from burial sites such as Sutton Hoo, near Suffolk. Sutton Hoo covers over fifty-six burials dating from the late sixth to early seventh centuries. Burial customs varied, some as inhumantion and some cremation, indicating that this period was a moment of a cultural flux and transition between the old pagan and new Christian beliefs. This unstable environment and constant rivalry for power created a need for luxury products in order to assert one’s status. This belt buckle was found in a mound I, an un-plundered tumulus with remarkable goods, leading archaeologists to believe that the individual buried here was very wealthy and prestigious. Some suggest that he was even a king, possibly Redwald (d. 616–28), as the belt buckle was found together with royal regalia. Although a buckle is a utilitarian object, this buckle is extremely luxurious and is entirely made of gold (hollow inside). The material itself is of utmost importance since, in the medieval period, material was one of the major means of communicating power, status, and holiness. Gold was extremely precious and this large shiny buckle would certainly catch the attention of every onlooker. Uniquely shaped, the buckle is decorated with two serpents inside a circle from which emerge large eagle’s heads with curved beaks. The large plate is covered with crouching quadrupeds entwined with more serpents. This type of pattern is called animal Style II and it became popular after c. 560–70. In Style II, animal bodies are elongated into ribbons, which form intertwined and undulating, symmetrical shapes–eschewing naturalism. They rarely have legs, and are therefore most commonly described as serpents, even though the heads often have characteristics of other types of animal such as eagles or dogs. In animal Style II, the animal becomes secondary to the ornamental interlace patterns. The Hiberno-Saxon Illuminated Manuscripts are one of the most distinct and impressive art forms that developed during the early medieval period in the West. Their style and form is a fusion of Celtic and Christian traditions. Although Celts originally occupied most parts of Europe, eastern tribes pushed them th to the western most strip of their land (modern day Ireland). Because of its remote location, Ireland escaped Roman conquests, and in the fifth century it was spared from the invasion of Germanic tribes. According to the legend, the island was Christianized with the arrival of St. Patrick (c. 387–463 CE), and since then, its secluded location provided a relatively stable environment for European scholars fleeing from the continent. Irish monasteries became centers of learning, knowledge production, and art for next two centuries. The most important products of these monasteries were manuscripts (manually written books). All manuscripts were hand made and produced from animal skin (sheep, goat, pig, cow) through a complicated process (de-haired, soaked in a lime solution, stretched, and left to dry). The words and images were then hand-painted by monks in monasteries. In this period, manuscripts were the major means of knowledge transmission and were used for liturgy and for missionary activities. Manuscripts were extremely costly: an average book containing four Gospels required anywhere from three-hundred to five-hundred animals to produce the pages. In addition, one had to pay for pigments, dyes, and years of labor. In the case of illuminated manuscripts (manuscripts containing images), the cost could raise exponentially since every picture demanded adding pages (counted in animal skins) and pigments. the page with the initial letters of the Gospel (incipit). A page from Book of Durrow, seen here, shows a Man, the symbol of the Evangelist Matthew. This page stands as the first page in the typical sequence of illuminations preceding the Gospel text. The man shown here is very different from Greco-Roman versions of human body; he is armless and his torso is flat, reduced to a colorful checkered pattern. The whole body is schematic: frontal, simplified with two eyes staring at the viewer, feet drawn in profile, and framed by a complicated interlace pattern. Using only four colors: yellow, red, green, and black, the artist focused on stylization, ornament, pattern, symmetry, and design. The checkerboard pattern and colors resemble cloisonné enamels (enamels produced by filling a golden or silver “pockets” with powdered silica mix and later fired to achieve a precious stone-like effect) that were popular wardrobe items during this period. Overall, this image indicates the persistence of local pagan traditions and its fusion with the Roman Christian subject matter. The lavish ornamentation of books like this could boost its owner’s status–just like the belt buckle did for its wearer. The Lindisfarne Gospels, produced in the Lindisfarne monastery of Northumbria, is also one of the earliest, well-preserved illuminated manuscripts. The page of Matthew, like a Man from the Book of Durrow, is also the first page in the introductory Gospel sequence. Unlike the Book of Durrow, however, here, the Evangelist Matthew is shown in the midst of writing his Gospel, and his symbol, a winged man, is shown above him. This portrait and its composition are based on the classical images of seated philosophers that were widespread in the Mediterranean tradition and ultimately derived from pagan antecedents. The drawn curtain (a man behind a curtain is an unidentified character) sets the scene indoors and Matthew is depicted at an angle with his seat is drawn in quasi-perspective–both typical Classical tropes. Yet, the artist of Lindisfarne does not copy the Classical style verbatim. For example, Matthew’s body is composed of flat areas of color delineated with decorations, rather than attempting to indicate three-dimensionality through shading and modeling. This style gives the scene more of an esoteric and spiritual character, rather than a portrayal of an earth-bound mundane task. Two words, Greek hagios and Latin Mattheus, identify the figure as Matthew. The combination of the two languages increases the status of the book, since both are the languages of prestige: Greek–the language of New Testament, and Latin–the language of Church of Rome. The Lindisfarne Gospels is one of the most elaborate of the Hiberno-Saxon manuscripts and has one of the largest amounts of illuminations without narrative text. Its size required at least three-hundred calfskins to produce enough vellum (parchment made of calf-skin) and its luxurious pigments had to be imported as far as from Himalayas. The Cross Carpet Page, also from Lindisfarne Gospels, is the second, so called “carpet page,” of the introductory Gospel sequence. This type of illustration was an invention of Hiberno-Saxon artists and so, does not occur in any of the Classical and late antique Mediterranean illuminated manuscripts. The entire page is a fusion of native pagan and Christian traditions: an interlacing carpet-like pattern of lines and knots that fill a color-coded Christian image of a cross and the space around it. Similar to the belt buckle from Sutton Hoo, this manuscript adopts animal Style II of metalwork: the symmetric patterning of loops and undulating lines form serpent-like dogs and birds that repeat in self-contained units. Their energy is, however, contained in color fields within the outline of a cross that frames the entire scene. The development of this elaborate ornamentation is unclear. It is possible that missionaries arriving from the south, amazed by the complexities of local metalwork patterning, created this new style together with local converts. The use of metalwork designs and expensive colors on manuscripts was probably meant to increase the status of the books as well. The third page in the introductory Gospel sequence is typically the incipit (initial words of the Gospel). The one shown here, Chi Rho Iota Page, comes from the Book of Kells, which is considered to be the greatest achievement of Hiberno-Saxon art. The book has the largest number and greatest variety of full-page illuminations, including carpet pages, Evangelist symbols, portrayals of Mary and Christ, New Testament narrative scenes, canon tables, and monumental letters. Produced in an Irish monastery of Iona and carried to Kells to escape a Viking raids, it has been revered and treated almost as a relic since it was made. This page begins the text of Matthew’s Gospel and consists of the initial letters of Christ’s name in Greek: χρι (χριστος – Christos) + Latin autem (abbreviated to h) generatio (literally “Christ happened”). The words, however, are barely legible, transformed into intricate and abstract designs of spirals, geometric shapes, and undulating lines that, again, are rooted in the Celtic and Anglo-Saxon metalwork tradition. Nevertheless, the abstraction is not total. In fact, the pages of the Book of Kells are famous for the hidden imagery depicting humans and animals, e.g. in this page we can spot a moth, a monks head emerging from the letter rho, cats flanking mice flanking a wafer, and an otter catching a fish. Scholars have theorized that looking for these hidden images could be a kind of premeditation of God’s word before properly studying the Scriptures. Up until this point, the majority of extant early medieval objects consist of manuscripts and small scale items like jewelry and personal adornments. The period from the eighth to tenth century marks the reappearance of a large-scale stone sculpture. The Irish large-scale stone crosses, like the Muiredach Cross, represent the largest body of freestanding sculpture produced between late antiquity and the Renaissance. This does not necessary mean that sculpture was non-existent in the early Medieval Latin West. Earlier crosses and other large-scale objects were most likely produced out of perishable materials, such as wood, and did not survive in wet climates. These monumental crosses served a variety of purposes. They could be used to mark boundaries of monastic lands, as mnemonic and devotional signs at a crossroads, to commemorate miraculous events or sacred spots, or as votives or penitential objects. 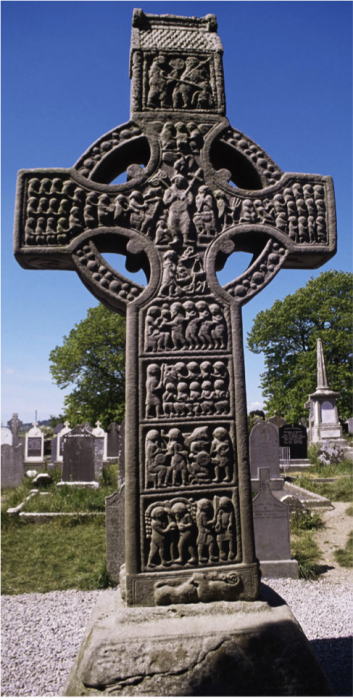 The Muiredach Cross is one of the largest and best-preserved examples of such Irish crosses. According to its inscription, it was built as a grave-marker for Muiredach, an influential Irish abbot, who died in 923 (hence we have a specific date for the cross). The cross is typical for the ninth and early tenth century; it combines extensive narrative cycles and devotional programs with Celtic decorative traditions. Celtic influence, for example, can be seen in the circle intersecting the arms of the cross. Originally, the cross would have been painted, but the weathering precludes any possibility of original color reconstruction. The central scenes are Christ’s Crucifixion (on the west side) and the Last Judgment (on the east side)—both themes well suited for its function as a grave-marker. The use of decorative, interlace patterns, especially visible on the base, indicate, just like with the manuscripts, the assimilation of pagan with Christian visual imagery. Just as Anglo-Saxon and Hiberno-Saxon were developing artistic and cultural traditions, Carolingians, on the continent, were searching for their cultural identity. Also an amalgam of Christian, Roman, and native practices, the new Carolingian state became the major power in the Latin West, and the first to be officially recognized by the pope. The pope crowned Charlemagne, its leader, as the new Roman Emperor in a ceremony that took place at St. Peter’s on Christmas Day in 800. The Frankish Empire (ruled by the Carolingian dynasty) soon sprawled to cover large areas of Europe, including the terrains of modern-day France, Germany, Switzerland, Belgium, Holland, northern Spain, and Italy. To create his new Christian kingdom, Charlemagne decided to model much of his state on the cultural advances and imperial protocol of ancient Rome. He avidly patronized monasteries furnished with extensive libraries, becoming the main centers of education. He also compiled a code of laws modeled on Roman precedent, and introduced many reforms. Eventually, he became one of the first warlord-rulers to create an administrative capital city, Aachen in 794, instead of controlling the empire through itinerant travel. Charlemagne built one of the most impressive early medieval palaces, a large complex that includes a throne room, reception halls, domestic structures, a chapel, a royal hunting lodge, and hot springs. Palatine Chapel was not only for royalty, but also served the public (the ground floor had a common entrance, while the second floor with a separate entrance was reserved for royalty). The chapel strongly relied on Roman building techniques, and became the first vaulted medieval structure north of the Alps. This Roman reference helped Charlemagne cast himself as the new Roman Emperor. An important architectural source for the chapel is Ravenna’s church of San Vitale, which Charlemagne visited himself and was deeply impressed by. The Palatine Chapel, however, was altered and simplified to fit the Northern traditions and climate. For example, the curved exedrae were removed causing the upper columns to hit the arches of the bays arbitrarily and the elaborate metal railings recall local metalworking traditions. Following the late antique imperial Mediterranean traditions exhibited by such major buildings as San Vitale, Hagia Sophia, and the Dome of the Rock, the Palatine Chapel is lavishly decorated with panels of colored marbles and its piers and vaults are covered with precious mosaics. The imperial ties are further highlighted by the incorporation of Roman and Ravennate spolia. Charlemagne’s throne was placed on the second level, above the ground floor and below the dome decorated with a mosaic of the throne of God surrounded by twenty elders. Furthermore, Charlemagne was seated directly opposite the altar of the Savior and could also view the altar of the Virgin Mary. In this hierarchical structure, Charlemagne is positioned between heaven and earth, acting as a divinely sanctioned ruler and mediator between God and his people. Like in many medieval churches, the chapel was intended to be viewed as an image of Heavenly Jerusalem. This metaphor was expressed in symbolic terms widely used in the Middle Ages, such as in measurements: the octagon’s circumference was one hundred and forty-four feet as described in the Book of Revelation, 21:17. As an icon of imperial power, dynastic burial place, and setting of imperial coronations, the Palatine Chapel became one of the most influential buildings of the medieval period, especially north of the Alps. Charlemagne’s admiration for the Mediterranean culture manifested itself in his patronage of arts and learning. He not only imported numerous manuscripts from Rome but also fostered their production locally. The Coronation Gospels, for example, adapted the imperial late antique style to local traditions. The manuscript is written in golden letters on purple vellum, pointing to the tradition of imperial Byzantine manuscripts (in Rome and Byzantium purple is reserved only for the imperial family). In the pages of the Evangelist Matthew, the artist emphasizes the figure without any additional architectural components, symbols, vegetation, or animals. Emulating the early manuscripts produced in the Mediterranean, the Coronation’s Matthew is very classical in style: he is presented as a volumetric, full-bodied figure, and sketched with illusionistic brushwork to create a three-dimensional effect. Unlike the Hiberno-Saxon examples, the artist does not rely on the use of line and flat areas of color. This illustration also lacks local pre-Christian decorative references, such as interlace patterns or animal style ornamentation. Instead, here the Roman model is fully embraced; Matthew is dressed in a toga, with a huge halo, sitting at his lectern. The monumentality of the figure and the classical inspirations align well with Charlemagne’s aim of establishing a new Christian Roman Empire. The magnificent and lavish manuscripts produced in the monastic and imperial scriptoria had to be protected by covers and during the early Middle Ages. The production of book-covers became an art form in itself. The Lindau Gospels has one of the most precious and luxurious Carolingian books-covers, fashioned in the workshop of Charles the Bold. Both protecting and increasing the status of the manuscript, the cover typifies the Carolingian/Medieval practice in that it is a composite piece. It consists of two parts: a front that is new, and an attached back, produced circa a hundred years earlier. The detailed, jewelry-like decoration recalls the early warlord-taste for precious portable objects. The back cover has animal interlace patterns, enamel, and is studded with pearls and gems. The techniques of enamel, gem-setting, and repoussé (on the front), all point to the rich traditions of metalworking in the Frankish and Carolingian empire. The four Evangelists and their symbols can be found on the back cover, rendered in a classicizing style and almost hidden in the small golden sections of the four corners. Christ on the cross is centrally placed on the front cover. He is depicted as a triumphant Christ, a youthful, monumental, and statuesque figure devoid of any pain and suffering, typical of the early Christian Mediterranean style. These covers typify the production of Carolingian period that is characterized by mixing and embracing a great variety of traditions. Nevertheless, the purpose of such rich ornamentation and precious décor is to raise and emphasize the status of the book as well as its owner. 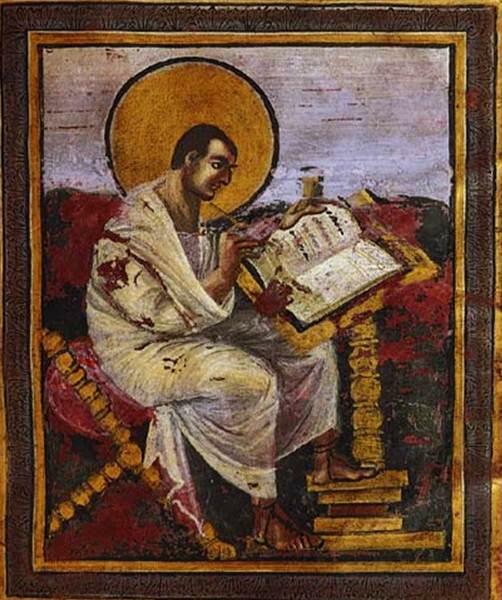 Page with St. Matthew the Evangelist, Coronation Gospels. Early ninth century CE. 12 3/4 × 9 7/8”, Schatzkammer, Kunsthistorisches Museum, Vienna. What was the most interesting thing you learned today and why? If you are confused about anything, please explain what puzzled you, or you may ask a question that you need to be answered in order to understand the material better. Alternatively, ask your students to summarize the main points of the lecture (pay attention if they discussed issues such art as a status signifier, fusion of artistic traditions, social standing, and survival of artifacts). What can we tell about the owner of this artifact? Why would an early medieval warlord want to own and probably display this thing? What can we tell about the style? Which traditions are referenced? Is there a preference for one or the other? What is communicated through this particular choice of style? After today’s discussion do you think that the early Medieval period deserves to be called “dark ages”? Why or why not? If your view changed, can you tell why?